Today was Day #3 of Chocolate and Truffle Theme Week. Italy is a great place to find truffle-infused favorite foods. So, I attempted to travel there, virtually, with today's pairing. First, I baked cheesecakes with (La Tourangelle) black truffle oil, and Ritrovo Italian truffle honey -- honey infused with black truffle. 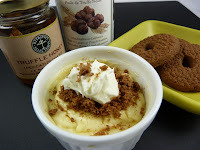 Then I combined one of these creamy little cheesecakes with today's crunchy, Italian chocolate cookies. 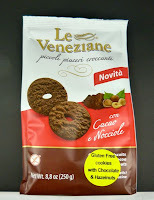 I crumbled one La Veneziane gluten-free chocolate and hazelnut cookie from Molino di Ferro (Italy), to use as a topping for the cheesecake -- along with some truffle honey and a dab of some creme fraiche -- and enjoyed two additional cookies by themselves. 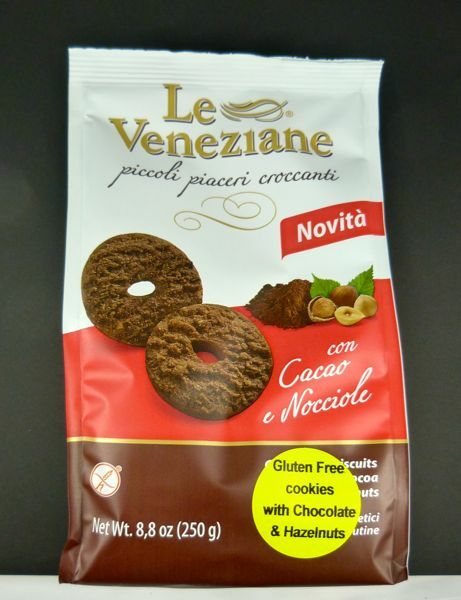 Note to self: Try spreading a little Nutella or peanut butter on these; this might result in a tasty sandwich cookie.